His journey began in 1945. He was a recent high school graduate and now an 18-year-old “Navy Man.” A Petty Officer Third Class. 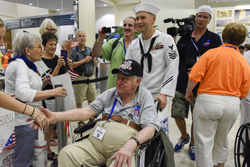 Yet little did he realize, he’d receive a hero’s welcome for his service as a World War II veteran, 70 years later. It was September 2nd, 3:05AM. Dad slowly entered my car. We left in darkness. First stop, Chicago’s Midway Airport. 3:40AM, Dad carefully exited my car. Orange-shirted volunteers gently helped him into one of his many “chariots” for the day. A smooth-movin’ wheelchair! I parked my car and headed into Midway to join the fun. (I spend lots of time in airports. Yet never have I seen such excitement and joy…in any airport, especially at 4AM!) Hundreds of volunteers were there to “serve” veterans. For they had served America, its citizens and future generations. 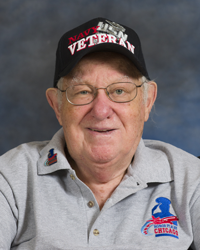 I donned my green Honor Flight shirt. I was now an “official guardian.” And I’d have the privilege of being Dad’s guardian for the day. Dad always encouraged and politely pushed me to succeed. Yet now, I’d be “pushing” him and his wheelchair, through crowded airports, around memorable D.C. memorials and up countless ramps. But first, an extensive, remarkably organized “check-in” process: Name tags issued. Ditty bags passed out. 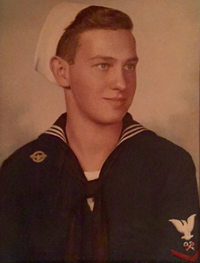 Portrait photos of each vet taken. We breezed through a special security line and once at the gate for our Southwest charter to D.C., we were treated to coffee, donuts and “time travel.” A live-band, featuring “Andrews Sisters” impersonators belted out hits from the 1940s. While volunteer dancers in 40s garb danced with veterans. Then the slow, methodical, highly efficient boarding process began. 85 vets. 8 nurses. 2 doctors. Volunteers. Guardians. Photographers and videographers. Finally, wheels-up. A glorious day to fly. As we entered the Dulles terminal, each vet was greeted by hundreds of volunteers, well-wishers, adults, children, high school teams and admirers, who thanked the vets for their courage and commitment with an extended handshake, a warm embrace, a high five, a huge smile or a simple kiss to the cheek. 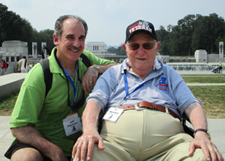 Visits during the day included; the Air Force Memorial, Lincoln Memorial, Vietnam Veterans Memorial, Korean War Veterans Memorial, the Air and Space Museum’s Udvar-Hazy Center and our most memorable visit to the World War II Memorial. D.C. was stifling hot. Yet there was never a complaint. About the heat. The lack of sleep. The pace of the day. It was now easy for me to understand, why this group of men and women, have been called, “The Greatest Generation!” Being with them and Dad, was a day of significance. It was late afternoon, and for the final time, almost 150 haggard yet happy vets, volunteers and guardians boarded our five buses. Off to Dulles! As we gathered at the gate for our return flight home, there was an audible buzz. Folks reflected on the day with new friends. They swapped stories about life during and after the war. And there was 1940s music, with a local dance group “cutting the rug” with women in polka dot dresses and men in zoot suits! One hour into the flight, the plane’s lights abruptly began to shine. 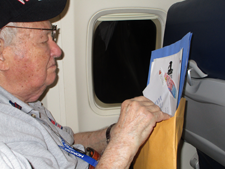 They were accompanied by a loud declaration over the plane’s PA system, “Mail call!” The vets were in disbelief. And awe! Each received a 9×12 envelope with their name on it. Inside; cards, letters, faxes, e-mails, crayon drawings, original artwork…from family, friends, business associates, local students and even the owners of Chicago’s professional sports teams. Each message offering sincere thanks, admiration and love to the vet for their service! 8:41PM, we landed. As we taxied toward the gate, a surprised vet exclaimed, “Is it raining?” Nope! Yet there was water raining down each side of the plane. The vets were receiving “salutes” from the Midway Airport Chicago Fire Department’s water canons! As the water streamed, so did the tears! As vets de-planed, they were greeted by applause and cheers. And that was just in the jetway, from Southwest crew members, Midway employees, Honor Flight volunteers and members of the Chicago Fire Department. And when you thought the raucous welcome couldn’t get any better, it did! As we headed to Midway’s ground floor, a band played patriotic American songs. 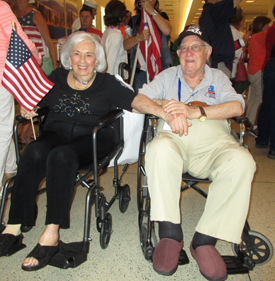 Plus Honor Flight transformed an expansive area of baggage claim, into a dedicated, winding parade route. Lined by almost 3,000 frenzied family, friends and admirers. Mom, we brought your Navy Man home safely. Dad, thanks for serving. You’re a hero. I love you!